Tune your internet radio dial to Doc Thompson's Daily Mojo and fill your cup with Doc's signature coffee. It's the perfect marriage of coffee & bacon, with just a hint of maple and a big scoop of cacao thrown in. Doc Thompson's CHOCOLATE Bacon Blast will give you the boost you need to start your day off Right. *** If you would like to try an exclusive new #APRgold coffee AND help an awesome non-profit organization, click on the Leigh’s Blend link below! Leigh’s Blend is a pound of amazing full city roasted, single origin Kenyan beans at a reduced price AND we will donate the ENTIRE $12 of each pound sold to Leigh’s Mission. We cannot ship Leigh's Blend without an additional coffee, tea, or Coffee Drop purchase (that helps us cover our shipping and production costs). A modern day tale of triumph over tragedy - Andra Good has turned the tragic death of her friend into an incredible organization that is changing lives all over the world. In honor of the legacy Leigh Ann Tonkinson has left behind, this exclusive APR offering is a powerful blend of Kenyan beans— full bodied with a complex molasses tone and roasted just dark enough to draw out their finest flavor. For more information, check out Leigh’s Mission HERE! Select Yes please! NO! I need the caffeine! 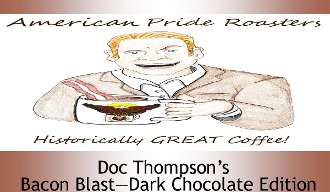 We are the OFFICIAL COFFEE of Doc Thompson's Daily Mojo! Click HERE to listen to the show. Leigh's Mission is the Official charitable organization of APR Coffee! They are changing lives for children all over the world. Please check out their exclusive premium Kenyan Coffee - an Add-on item available with every coffee on our page. 100% of each pound of Leigh's Blend goes directly to Leigh's Mission! Check out their amazing work! of the Salty Army on Twitch.tv!!! Copyright © 2012-2019 American Pride Roasters. All rights reserved.